One year after the signature of the Minsk 2 agreements, on February 15, 2015, the war in Donbas is unrelentingly looming towards a military and diplomatic stalemate. At the military level, the conflict is swaying between frozen positions and some level of fluidity provoked by constant ceasefire violations along the contact line with the separatist “Republics” of Donetsk and Luhansk. On the diplomatic side, Ukraine and Russia are entrenched in insoluble contradictions and uncompromising interpretations over the implementation of the Minsk 2 agreements. Conflict settlement is hampered by several thorny political issues, and notably the creation of a “special status” for Donbas and the organization of local elections therein. Without the irruption of external factors, the situation could remain in a deadlock for many years, lest the separatist territories turned into a dead enclave within Ukraine. Over a year after the signing of the Minsk 2 agreements, on 12 February 2015, by Ukraine, Russia, France, and Germany, the peace resolution process is in a stalemate. Following the failure of several rounds of negotiations, Kyiv and Moscow are now entrenched in insoluble contradictions and uncompromising interpretations over the implementation of the agreements. On the warfront, the ceasefire is far from being respected, as firefights are constant on both sides of the line of contact between Ukraine and separatist Donbas. It is therefore important to analyze the political and military obstacles to the implementation of the Minsk 2 agreements and to assess how the military situation is evolving on the ground between Ukrainian forces and the “People’s Republics” of Donetsk (DPR) and Lugansk (LPR). Also, what are the main bones of contention between Kyiv and Moscow and what are the possible scenarios of evolution for what could eventually become a “frozen conflict” at the gates of Europe? Military positions have remained unchanged on the line of contact between the warring sides since the Battle of Debalsteve in mid-February 2015 The Battle of Debalsteve and its takeover, right after the signature of the Minsk 2 agreements, was the last large-scale military operation undertaken by separatist forces. It froze the contact line on present positions.. Since then, the active phase of violence has gradually turned into a war of positions and trenches. Provocations and ceasefire violations (in the form of targeted shots from automatic rifle and artillery fire Notably mortars and heavy weapons (120 mm and 82 mm) – weapons that separatist forces were supposed to have pulled out from the conflict zone after the signature of Minsk.) have been recorded daily ever since; they have been concentrated mostly on the “usual” border hot spots in the Donetsk sector of the frontline Mostly Trotskye, Opytne, Makiivka, Mariinka, Zaitseve, Gorlivka, Mayorsk, etc. in the suburbs of Donetsk, around which the bulk of Ukrainian forces are concentrated.. While not reflecting a willingness to provoke a resumption of hostilities, attacks by the separatists meet the tactical imperative of maintaining a controlled and calibrated military tension along the contact line, although without major escalation of violence. On the one hand, this gives them the advantage of forcing Ukrainian troops to reciprocate, a sort of entrapment that separatists can then use against Kyiv by playing the blame game of non-compliance with the ceasefire. On the other hand, it distracts Kyiv from reforms and tires out Ukraine militarily and economically, while weakening Kyiv’s positions and claims in the Minsk Group negotiations. It is important to make out, however, the difference between targeted exchanges of fire between Ukrainian troops and rebel forces on the one hand, and other registered outbursts caused by war fatigue Psychological fatigue on the Ukrainian side and drug-/alcohol-induced wear & tear on the separatists’. as well as by the settling of scores among criminal groups involved in illegal trafficking on both sides of the conflict line Lucrative trafficking (mostly drugs, coal, and scrap metal) is one of the main sources of income for separatist troops and battalions of the “People’s Republics”. on the other hand. While all ceasefire violations are recorded the same way by the OSCE and the Ukrainian army, their nature is excessively diverse from one situation to another. In this, the OSCE – whose Special Monitoring Mission (SMM) is in charge of monitoring the ceasefire and the withdrawal of heavy weapons – is very limited in its actions and is not able to access the entirety of the breakaway territories, which renders it unable to achieve effective and objective monitoring. In addition to permanent destabilization attempts by the separatists, elements affiliated with Russian security forces Mainly units from military intelligence (GRU) and the federal security service (FSB). They are seconded by 6,000 to 9,000 Russian “troops” (contractors and members of volunteer battalions) on the territory of DPR/LPR. are engaged in military operations on the territory of the “Republics” of Donetsk and Lugansk. Beyond the necessary tactical appropriation of these territories and their rationalization in terms of military structures, Russian armed forces directly engage in high-intensity frontline operations. Small Russian infantry detachments conduct regular incursions into Ukrainian territory: these reconnaissance missions allow Moscow to “test” the solidity of the front, map out the reaction of Ukrainian forces, and assess potential advances. These actions are nowadays mostly concentrated in the Donetsk sector, between the towns of Kominternovo and Krasnoarmiysk, and notably towards Mariupol. The latest ceasefire violations, most of which are focused on the same hot spots in the Donetsk sector, have allowed Moscow to expand its control throughout the frontline and thus test the reaction of Ukrainian defenses in situ. In recent months, the qualitative upgrade of monitoring and interception military equipment supplied by Moscow (last generation jamming stations « Ground-based Battlefield Surveillance Radar Station ‘Leopard’ Spotted in Donbas », Inform Napalm, 25 April 2016., drones and UAVs, etc.) to the separatists also shows that the Kremlin has accepted the “freezing” of the military positions on the contact line. Interestingly, such surveillance equipment could also be used by FSB and GRU troops to control the movements and actions of separatist forces. 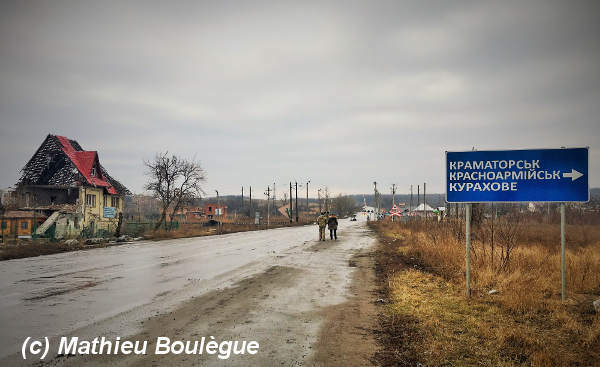 Through its “grey area diplomacy” Mathieu Boulègue, « La recomposition de « l'étranger proche » à la lumière des événements en Ukraine », Notes de la FRS, Fondation pour la Recherche Stratégique, note n°17/15, 30 July 2015., Russia managed to transform Donbas into a war zone whose very definition and conceptualization are problematic. Indeed, if the conflict is entering a “freezing” phase, the contact line retains some level of fluidity. Similarly, if military positions are “frozen”, the low intensity conflict is gradually turning into a war of attrition Military positions have remained unchanged for more than a year, and so did most commanding officers on the Ukrainian frontline. Attrition also impacts the political negotiations at the level of the Minsk Group and “Ukraine fatigue” at the diplomatic level. The war effort is highly visible in Ukraine, thus affecting economic and social structures in the country, and faces increasing rejection on the part of the population.. Separatist Donbas is now a militarily unstable buffer zone deliberately kept in that state of predicament: the situation on the ground today bears close resemblance to that in Transnistria from the political (de facto territorial separation), economic, and social point of view Matthew Rojansky, « An Enduring Confrontation », in Paul J. Saunders (ed. ), The United States and Russia after the Ukraine Crisis: Three Scenarios, Center for the National Interest, 2015.. Russia’s role in the conflict, ranging from territorial instrumentalization to direct aid aimed at the survival of the separatist entities, is also relatively similar. In other words, the war in Eastern Ukraine has been created and artificially maintained from the outside, and Moscow bears total responsibility in the continuation of the conflict. This situation is especially convenient for the Kremlin, which continues to rely on the rhetoric of “plausible deniability” when it comes to the presence of Russian troops in occupied Donbas. The logic goes that Russia cannot (officially that is) be considered a direct perpetrator or a party to the conflict. For lack of a better term, “conflict conservation” seems to describe the war in Donbas the most accurately Vladimir Socor, Conserved Conflict: Russia’s Pattern in Ukraine’s East”, Eurasia Daily Monitor, 17 December 2015. (a situation of “neither peace nor war” prevails on the ground, benefitting separatist forces and Moscow). In this context, Russia retains the keys of escalation dominance and holds the monopoly of military gradation. It would be wrong, however, to believe that Russia keeps complete control over the security and political life of the separatist entities. While Moscow keeps a strong grip on local leaders, on political representatives within the framework of the Minsk 2 working groups, and on primary military structures within the “People’s Republics”, it does not oversee relations between battalions and local politicians, which are left at the discretion of local “authorities” International Crisis Group, « Russia and the Separatists in Eastern Ukraine », Europe and Central Asia Briefing, n° 79, 5 February 2016.. This situation is potentially dangerous for Russia, as Moscow must maintain some clout over local security services and thus avoid a loss of control over swaths of separatist territories in the hands of “warlords” barricaded in their local strongholds Kimberly Marten, « The Security Costs and Benefits of Non-State Militias: The Example of Eastern Ukraine », Russia in Global Affairs, 23 December 2015.. This partly explains why GRU and FSB troops have been conducting military operations in the secessionist entities since mid-2015: rebellious battalions and rogue commanders not responding to the official chain of command of local Interior security forces (Oplot) are systematically disposed of. Several targeted killings and other “cleansing” operations have been recorded in recent months within the ranks of separatist forces “Cleansing” of the “Sparta” and “Somalia” battalions in DPR, targeted assassinations of military commanders such as Pavel Dremov, Alexey Mozgovoy, Evgeny Kononov, and Alexander Bednov, etc.. The latest (and impressive) such operation shed some light on the aborted attempts by DPR “President” Oleksandr Zakharchenko – backed by Moscow – to reassert control over the city of Yasinovota, the stronghold of rogue commander and leader of the “Vostok” battalion Oleksandr Khodakovsky « Khodakovskiy zayavil po svoey vozmozhnoy likvidatsii po prikazu Moskvy », Novoe Vremiya, 22 February 2016. Khodakosvkiy profits from a criminal system organized around the sale of coal. His stronghold Yasinovota is a railway node for the transshipment of coal extracted from coalmines controlled by separatists and sold back to Ukraine.. Without the direct support of Russian troops, Oplot forces have only limited military means of their own to retake territorial strongholds from local “warlords” (some of whom, including Khodakovsky, have become quite troublesome for Moscow). For their part, separatist leaders, including the political “elite”, are increasingly aware that they are all expendable, which contributes to increase internal violence and the scale of the grey economy. This situation is the corollary of a massive impoverishment of secessionist Donbas, now only surviving through the development of a war economy. The grey area in Donbas is falling victim to the predation of the scarce remaining resources Russian subsidies, forced nationalization of local companies, illegal trafficking, corruption networks, etc., turf wars between battalions, subsistence economy, and total institutional decay. Russia has no interest in rebuilding or developing the “Republics”, but instead has chosen to conduct a policy of large-scale economic dismantling Among other plans, Russia retrieved a number of human and technological assets from the Ukrainian military-industrial complex. Moscow also uses a “scorched earth” policy (systematic dismantling of non-productive companies and plants, flooding of mines, etc.). aimed at making the cost of rehabilitation intolerable for Kyiv. If the war in Donbas is entering a “freezing” phase, conflict resolution embodied by the Minsk 2 agreements has already reached ice age. Since February 2015, no real progress has been observed on either side of the demarcation line between Ukraine and separatist entities / Russia. After several months of fruitless negotiations, the dialogue is completely mired, without any real hope the situation can be unlocked, due to maximalist positions and unwillingness to compromise on both sides. The heart of the problem lies in the diverging narratives and interpretations of the sequence of implementation of the military clauses (full compliance with the ceasefire, withdrawal of illegally-stationed troops and heavy weapons, exchanges of prisoners, etc.) and political terms (mainly local elections and law on “special status”) between Kyiv and Moscow. Ukraine insists on the prioritization of the implementation of the military elements of Minsk 2 as a precondition to a political settlement. For Kyiv, local elections in Donbas can be organized only if the necessary security conditions are met on the ground. The Ukrainian diplomacy also states that the political conditions put forth by the Minsk 2 agreements are in violation of Ukrainian law – in particular the de facto recognition of the separatist entities The implementation of a “special status” in separatist Donbas would mean such de facto recognition of the existence of the breakaway territories, just as much as would be its enshrining in the Ukrainian Constitution and the organization of local elections under a separate electoral law.. Kyiv finally insists that despite unilateral efforts to come up with solutions, separatist representatives do not offer constructive steps. Conversely, Russia seeks to impose a political settlement of the conflict between Kyiv and the “authorities” in DPR/LPR Moscow does not consider itself a warring party or part of the conflict, but only a mediator at Minsk 2.. According to the Kremlin, local elections and the vote of the “special status” for the breakaway regions are preconditions to military stabilization. Moscow is also concerned that the “People's Republics” are not officially represented in either the Minsk Contact Group Representatives from the “People’s Republics”, however, have a seat in the four trilateral working groups within the OSCE Contact Group. or the Ukrainian Rada. Finally, Russian diplomats accuse Ukraine of “playing for time” by legally pushing back the vote of the law on “special status” and the constitutional reform on decentralization. Due to the lack of genuine progress, the international community has gradually abandoned the concept of full respect of the ceasefire and of the military clauses of Minsk 2. This carries the risk of inexorably tilting towards a political (and thus Russian) interpretation of the February 2015 agreements, at the expense of Ukraine. This approach has been gradually pushed forward in order to avoid a complete breakdown of diplomatic negotiations, all the while forcing Ukraine to further compromise on its territorial integrity and the inviolability of its borders. On paper, the Minsk 2 process implies that Ukrainian sovereignty is now conditional to the application of the political clauses of the agreements, and therefore negotiable depending on Kyiv’s efforts and compromises. This strengthens Russia's position in the conflict resolution process, including its commitment to the political interpretation of the agreements, while projecting most of the blame of successive diplomatic failures on Kyiv. Western powers, together with Moscow, have tried since summer 2015 (so far unsuccessfully) to find “alternative” solutions to the repeated blockages in the conflict settlement process. On October 2, 2015, a summit organized in Paris Benoît Vitkine, « Ukraine : le sommet de Paris acte le report de l’application des accords de Minsk », Le Monde, 2 octobre 2015. put on the table the “Morel plan”, a roadmap outlining an implementation sequence for the political and military clauses of the Minsk agreements This means enacting the political clauses before the military ones, hence adopting a Russian interpretation of the agreements.. The roadmap, however, was rejected by Kyiv because it proposed a separate electoral law detached from the Ukrainian one for the local elections in Donbas. This special law would have been written in consultation with separatist “authorities” – something that was not provisioned by the February agreements. The political preconditions of the "Morel plan” were largely inapplicable for Kyiv as they would have meant the de facto (if not de jure) recognition of the existence of the DPR/LPR under a legalistic and electoral varnish. Furthermore, the “engineering” of a new electoral law under the supervision of separatist representatives (i.e. under the direct supervision of Moscow) would have posed obvious problems (among others the downright acceptation of rigged elections). In early 2016, the “Steinmeier formula”, put forth by German Minister of Foreign Affairs Frank-Walter Steinmeier at the level of the OSCE trilateral political subgroup, came as the latest (aborted) Western-sponsored attempt at unlocking the diplomatic impasse. This purely political “formula” envisioned the swift organization of local elections in the separatist “Republics”, validated by the OSCE, and the entry into force of the law on “special status” in the Ukrainian Constitution. In other words, another completely unacceptable proposal for Kyiv. In the context of the embarrassing but growing phenomenon of “Ukraine fatigue”, Washington and Moscow have been holding bilateral meetings since spring 2015 to try and find common ground for conflict resolution (but leaving Kyiv out of the process). This parallel diplomacy was notably illustrated by the backchannel set up in April 2015 between American Assistant Secretary of State for European and Eurasian Affairs Victoria Nuland and Russian Deputy Foreign Minister Grigory Karasin. The bilateral backchannel moved forth in early 2016 with the intrusion of Vladislav Surkov – a well-known Kremlin ideologist and Putin crony. The two diplomats met in mid-January 2016 in Kaliningrad for several hours of discussion that were deemed “constructive and useful” « Top U.S., Kremlin Officials Meet for Ukraine Talks near Kaliningrad », Radio Liberty/Radio Free Europe, 15 January 2016..
On top of diverging interpretations of the Minsk 2 sequencing (and in a context where the sides do not discuss military issues), Ukraine and Russia also differ over the content of two thorny political problems: the law on “special status” and the organization of local elections in the breakaway territories. The law on “special status” was initially planned in Article 4 of the Minsk 2 agreements but its interpretation now involves the legal recognition of the “People’s Republics” as separate entities from the rest of Ukrainian territory. The West, through the “Morel plan” and the “Steinmeier formula”, even pushed for its constitutional recognition, which was not anticipated by Minsk 2. In light of these unacceptable political preconditions, Kyiv voluntarily linked the enactment of the “special status” with the success of the constitutional reform on State decentralization. A wise choice considering the fact that both reforms are mutually stalling one another through legal means – anything possible to buy some time The second reading of the decentralization law was pushed back in early 2016 after a motion was sent to the Constitutional Court concerning the interpretation of Article 155 of the Constitution. Legally, the Rada could potentially vote the law before the end of the next Rada session at the end of July 2016.. If decentralization is deemed a necessary reform, it requires the approval of 300 MPs, a constitutional majority the Rada does not have presently. The next logical step should see Russian attempts (probably backed by the West) at implementing the “special status” on a permanent basis through electoral recognition in the wake of a potential local ballot. Holding local elections in the rebel territories is another issue advocated by the international community and Russia at the expense of Kiev. While everyone agrees on the genuine need for these elections (if only to unlock the Minsk process), Kyiv and Moscow have conflicting views on the methodology to follow. The Kremlin, in connection with recent Western proposals, wants Ukraine to directly negotiate a new, special electoral law with the separatist “authorities”. Such a hybrid law would take into consideration the demands of the “Republics” (i.e. Russia’s demands) and subsequently enshrine the legal existence of the entities, all this validated by the seal of the OSCE. Meanwhile, separatist leaders consistently come up with election dates – completely fictitious and constantly pushed back « Date of Elections in the So-Called Donetsk People's Republic Moved to July 24 », UA Wire, 20 April 2015..
Kyiv, for its part, considers that local elections can only take place once stringent security conditions are met Namely: full and comprehensive ceasefire, complete withdrawal of illegal troops and heavy weapons, and border control.. Accordingly, Ukraine insists on a number of preconditions: IDPs should be allowed to vote, separatist representatives should not obtain pre-election amnesty, free and fair competition should be granted for all Ukrainian political parties This (inapplicable) provision means that candidates for Ukrainian parties would be allowed to campaign freely all over the separatist territories alongside Ukrainian media and observers.. Ukrainian and Russian pre-requirements are once again difficult to reconcile, yet the international community might be tempted to force the organization of such elections, even with democratic substandards. In recent weeks, Moscow and Kyiv seem to have made progress on the potential deployment of an international armed police mission on the territory of DPR/LPR under OSCE mandate. The police force would be responsible for ensuring security during local elections as well as protecting candidates and observers. However, the very contents and mandate of the mission are yet another source of quarrel between Ukraine and Russia: while the Kremlin would agree only to a temporary and limited presence « Russia 'Backs Deployment of OSCE Armed Police Mission to Donbas' », Kyiv Post, 25 April 2016., Kyiv wants to set up a permanent and expanded force. What possible developments in Donbas? Given the adamant positions in Ukraine and Russia, only an external factor would be able to break the deadlock and overcome repeated diplomatic failures within the framework of the Minsk 2 agreements. In that sense, the decision to move forward (or not) in the coming months will likely stem from Moscow, as several underlying signals are already detectable – another proof of Russia’s strategic adaptability when it comes to the existence and survival of separatist Donbas. Overtaken by economic realities and facing the impossibility of maintaining multiple open fronts (keeping Crimea and safeguarding the national economy), Russia might have to abandon the “Republics”. Since the bulk of international sanctions against Russia is linked to the respect of the Minsk agreements, Moscow might have made the calculus that getting rid of the rebel territories could be the most lucrative option. Keeping the “Republics” alive turned out counter-productive to the Kremlin and finding a negotiated political solution could mean handing over the separatist territories back to Ukraine. For its part, Kyiv needs to demonstrate it is able to get a political “victory”: while it has proved unable to recover Crimea and to reform the country, getting these territories back would be a quick-fix solution. Hence, Donbas would become the lowest common denominator in the process of solving the Russia-Ukraine conflict. The Russian position is now concentrated on the priority of organizing local elections as a first step towards the political settlement of the conflict and the possible return of Donbas in Ukraine. The most likely option would be for the Kremlin to leave the legal and territorial control of the “Republics” to the Ukrainian government under an advanced autonomous status (similar to the situation in Kosovo before it reached independence in 2008). This would be a good face-saving solution for Moscow, but such a situation would leave factual reintegration in Ukraine not so clear in practice (in particular for the problem of border control). This “Kosovo option” Timothy Ash, « Is Ukraine-Russian Peace Deal Brewing behind the Scenes? », Kyiv Post, 18 January 2016. would be particularly advantageous for the Kremlin since the cost of the reintegration and rehabilitation of Donbas would be covered solely by Kyiv (and ultimately by European taxes and international loans). Ukraine would also have to handle harsh local political realities and grievances, post-conflict reconstruction, and territorial re-appropriation of the region. A daunting task, for taking over effective control of Donbas would imply transferring the “poison chalice” to Ukraine as a continuation of Russia’s destabilization strategy. Also, as the conflict in Eastern Ukraine would be considered politically “settled”, Russia could expect a gradual lifting of international sanctions. New Russian negotiators appeared on the forefront of the diplomatic scene in early 2016: Boris Gryzlov, a former Chairman of the State Duma and member of the Security Council of the Russian Federation, has become the Russian representative to the Minsk Group, and Dmitry Kozak, a former special envoy to the North Caucasus and initiator of the “Kozak memorandum” for Transnistria, has been designated the representative to the “People’s Republics”. These appointments did not occur by chance: both diplomats are close to President Putin and their experience in crisis management is expected to allow them to efficiently cut deals with Kyiv concerning local elections but also to reign in separatist demands Anders Åslund, « New Russian Management of the Donbas Signifies Putin May Be Ready to Negotiate », Atlantic Council, 4 January 2016.. The involvement of Vladislav Surkov in the management of the Donbas file is also not inconspicuous. On the Ukrainian side, several conflicting proposals have been circulating in recent weeks to try and unlock the political aspects of Minsk 2. On the one hand, the “Medvedchuk plan” (taking after Viktor Medvedchuk, a Ukrainian oligarch with close links to Moscow) reportedly proposed to hand over the governance of separatist entities to “acceptable” leaders for Ukraine and Russia – i.e. to oligarchs Rinat Akhmetov and Yuriy Boiko « Poroshenko Shows Interest in 'Medvedchuk's Plan' to Set up Administrations in Donbas Led by Akhmetov, Boiko », Interfax, 12 February 2016.. On the other hand, the Opposition Bloc introduced a draft law pushing for the creation of an “inter-regional territorial association” (MTO) in separatist Donbas with an independent administrative system « V oppozitsionnom bloke predlagayut sozdat’ nekoe ‘MTODonbass’ », Comitet.su, 29 March 2016.– which would amount to nothing less than the formal federalization of Ukraine. None of these projects seems feasible but their very existence keeps polluting the internal political debate. For Kyiv, a potential solution would be to transfer the “poison chalice” directly to Russia, at least temporarily, by forcing the legal recognition of the “frozen” conflict through a law on occupied territories. Such an evolution would be detrimental for Moscow, who has no interest in recognizing the conflict as legally frozen and in facing the subsequent risk of having to carry the dead weight of Donbas indefinitely. Without the resolute commitment of external actors, the inextricable situation in which Kyiv finds itself with Donbas could go on for many years, with the risk that the separatist territories might gradually become a dead enclave within Ukraine, seriously undermining the country’s prospects for Euro-Atlantic integration. The question remains whether Donbas will be inscribed in geopolitics textbooks as yet another “frozen conflict” in the post-Soviet space, certainly as a category of its own but alongside the likes of Abkhazia, South Ossetia, Transnistria or Nagorno-Karabakh. If that is the outcome, Russia will have managed to dictate a new precedent in terms of international practices, the eventual reproducibility of which could become problematic to European and NATO interests.